Tourism bosses are working on a bid for more than a million pounds to improve facilities at Crimdon beach. Durham County Council is preparing to submit an application later this month for £1.5m. If approved, this cash, from the Government’s Coastal Communities Fund, would be put towards a new cafe, toilets and volunteer centre, with building work potentially starting later this year. The area is popular with families and with bird watchers, who are drawn by Little Terns, a rare sea bird which migrates from West Africa to breed. Improvements at Crimdon are parts of wider plans to overhaul the Durham Heritage Coast. 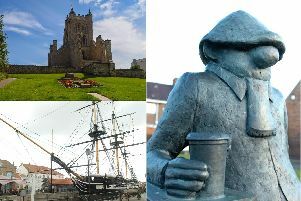 According to council reports, Crimdon was once a ‘thriving holiday destination’ and it is hoped investment could return some of its former popularity. “The short version is miners got holidays and went to Crimdon,” said Niall Benson, the county council’s principal heritage coast officer. “In its heyday there was a Miss Crimdon competition and it was a big resort locally. “Then, Spain and jet travel came and it declined and was demolished. As well as the Coastal Communities Fund, the area also hopes to secure more cash through the SeaScapes project. The Tyne to Tees Shores and Seas, Seascape Partnership Project, to give it its full title, covers the coastline from the iIver Tees up to the River Tyne, including Crimdon. With the support of the Heritage Lottery Fund the scheme, is expected to see about £5m spent on the coast over the next six years improving the environment and other elements of coastal heritage. This could include up to 30 ‘special projects’, such as improved access to beaches, wildlife surveys and exploration of shipwrecks. Crimdon also provides access to the England Coast Path, which is expected to be the world’s longest managed coastal trail when it is completed in 2020.